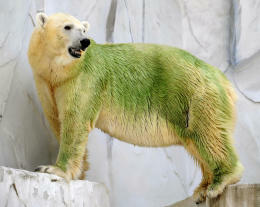 AP- TOKYO — Green polar bears are drawing questions from puzzled visitors at a Japanese zoo. “Visitors seem to be shocked by the color, and we are asked every day why they are so green,” he said. High temperatures in July and August and less-frequent water changes because of the zoo’s conservation efforts caused an algae growth in the bear pond and safety moat, Kurobe said. Algae that enters hollow spaces in the bears’ fur is hard to rinse off, he said.